Emotional Atyachar is a quirky, dark, humorous, non-linear, connect-the-dots, pulp-type fiction. With performers like Vinay Pathak, Ranvir Shorey, Abhimanyu Singh, Ravi Kissen, it's short, but not-so-sweet fun. It's so exciting when you are watching a film and you start thinking of the specific people who you want to recommend it to. And it's such an anti-climax when you get out of the theater and the enthusiasm to spread the word has somewhat dithered. I don't really know if I can blame the makers for the climax because there aren't too many other ways the film could have gone. But, while Emotional Atyachar lasts, you are promised sharp dialogue from the world of sleaze. Thus you have been warned to the crass language and innuendoes. But the humor is quirky and comes and goes really quick, so you have to be attentive and of course get past the profanity. There are random little things which you might not remember later, but if reminded they are sure to bring a smile. Emotional Atyachar has an absolutely fantastic start. The spooky feel and range of characters builds and maintains intrigue. Right from the wannabe, Gujrati businessman to the muse played by Kalki Koechlin, each character is eccentric in one way or the other and it works. Yep! Even the stereotype works, because of the everyday yet witty dialogue. However, the film suffers the way any 90-minute film with so many characters would. Looks like an inexperienced person had some say in what parts of the story stays out of the film. 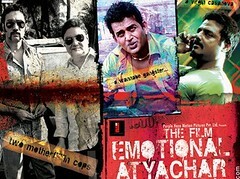 In a film which otherwise had a decent flow, Emotional Atyachar has a few effects without any apparent causes. For example, why the businessman is refused funding or how does a character free himself after being tied down. The amateur editing also shows in the fact that the 90 minutes run-time is split into 60 minutes pre-interval and 30 minutes post-interval. It makes the film seem longer than it actually is. Which also means any longer and the film would have suffered. So, the editing was necessary but not necessarily done well. Despite that there is enough in the film to warrant a trip to the theater if dark, pulp-type fiction is your kind of entertainment. It's a circular story which runs through a businessman who is dumped by a potential investor who wants to invest in a casino instead the owner of which owes a local don money who has hired two corrupt policemen to extort the money one of whom likes the casino-owner's girlfriend who is trying her best to dupe everyone around for the money which is actually robbed by a wannabe goon and two of his dysfunctional assistants whose van is spotted by the businessman. And there is a bag full of money in the middle of all this. E.T. 's picture at the back of the car. Added to the intentional spooky feel brilliantly! What kind of a smallish project was Vikram Jaiswal trying to get funds for? The small bag of money all these people were running after couldn't have held more than 500 wads of 100, 1000 Rupee notes. Maximum 5 crores? Mind you, Vikram is introduced to us as a businessman whose name has brand worth. An intelligent businessman opens a bag in an abandoned vehicle on a lonely highway in pitch darkness? The narrator's identity isn't shown at all, it's kind of disconcerting. Also, his voice comes and goes pretty much randomly. The Gujrati guy loses his accent and stereotyped style of talking as the film progresses. Vikram Jaiswal's irritation with Sophie as if she's been annoying him for a few hours now. Where did Vikram get the gun from? And why did he not use it earlier? Concept: It’s a connect-the-dots storyline. Different characters are sewn together and this unfolds bit by bit. @Makarand oh wow...that's a surprise. I wouldn't have thought that you'll like the film. I'd recommend Ek Chalis Ki Last Local and Manorama Six Feet under if you haven't seen them yet. 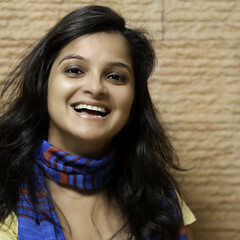 @Makarand it's girly and pink, so i'd say good call.